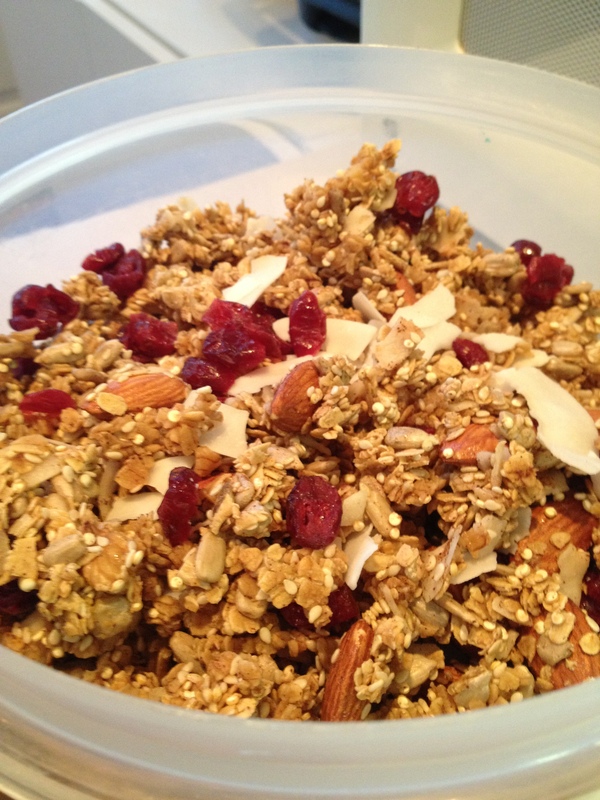 Have you bought granola recently? Holy cow it’s a fortune!! I’ve seen a few recipies here and there for it but I never tried to make it. Recently I took the cookbook ‘Quinoa 365’ out of the library and spotted their ‘Ultimate Granola’. Well-it wasn’t MY ultimate granola as I can’t stand raisins and I’m not much of a pumpkin seed fan-so I made it my own. 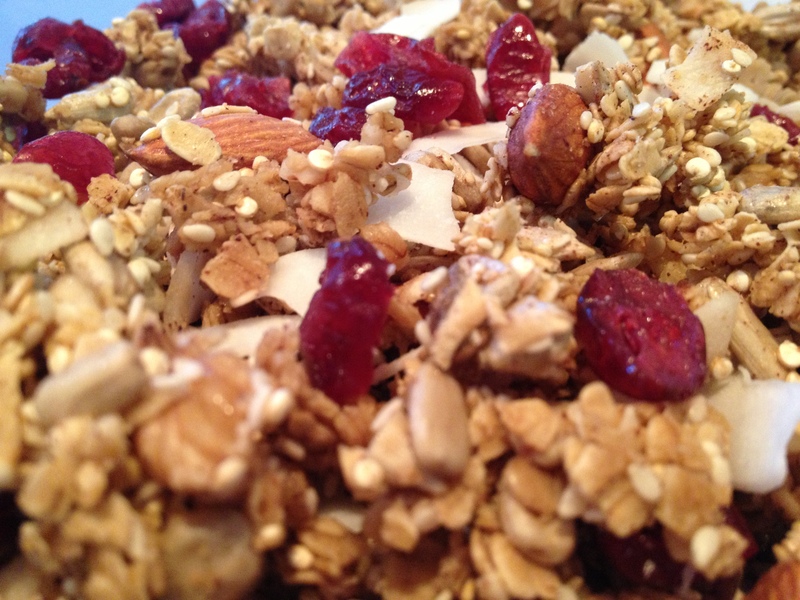 It’s full of all kinds of good stuff-the flake coconut and the tart cranberries are so great together and I love the whole almonds and parts of walnuts. Feel free to make the same kind of adjustments to YOUR ultimate granola. Combine all ingredients through and including walnuts in a large bowl and mix well. In a small bowl mix the syrup and vanilla and stir to combine. Pour the syrup over the oat mixture and stir until evenly distributed. Add the cinnamon and stir again until evenly mixed. Spread mixture evenly onto a rimmed baking sheet and bake for 1 hour in the preheated oven. For this month’s blog swap I was assigned Jenna’s blog. Wow she has some great recipes-go take a look! Bee sure to check out the other great recipies from the swap-just click the frog link below. It was tough choosing only one from all of them but in the end I chose Parmesan Quinoa. I’m trying to learn new ways to serve this delicious little grain and, since I put Parmesan on basically everything, this was the natural choice. In her recipe it calls for a miniscule 2 pinches of Parmesan. Sacrilege darling!! That’s far too little. I upped it quite a bit. Add the stock and quinoa to a medium sauce pan and place it over high heat. Cook for a total of 12 minutes (it will be a little al dente which is how I like it. Cook it longer if you like it softer). Remove from heat and drain. Stir in parmesan and serve. Note: I buy quinoa that I don’t have to rinse so I omitted that step from the recipe. Use a high-quality parmesan and a micro-plane to grate it. Thank you Sarah from http://tasteofhomecooking.blogspot.com/ for hosting the swaps. I really do like spicy and sweet foods-especially when I can let them cook all day and then put them over something delicious when I’m ready to eat with a minimum of effort. Yes-lazy days at their best. That day for me was Sunday this past weekend. 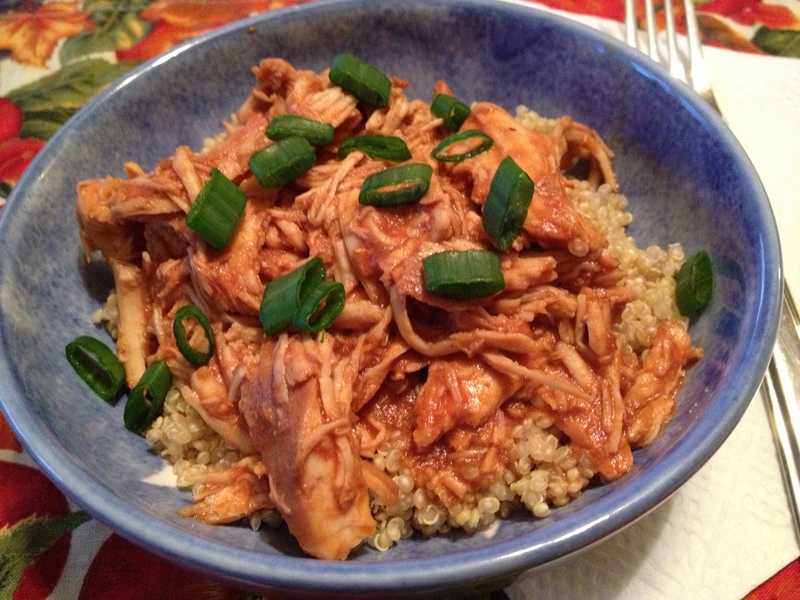 I wanted to catch up on some shows that evening and have a yummy and really easy dinner too so I made this delicious chicken and put it over quinoa which, I’m so happy to say, is easier than rice to cook. I always seem to burn or undercook rice. Anyway this chicken turned out so delicious-moist, flavorful, pretty darn waist-line friendly and enough for left overs the next day or 2. I served it over quinoa for no other reason than I’m bored of (fill in the blank) over rice. And it was yummy!! Combine ingredients from soy sauce through (and including) sriracha in a small bowl and whisk to combine well. Set aside. Place chicken breasts on the bottom of the slow cooker, season with pepper and then pour the soy sauce mixture over the chicken. Cover and cook on low for 3.5 hours. After 3.5 hours remove the chicken and set it aside on a plate. Remove any bits of fat from the sauce in the cooker. Mix the cornstarch and water well and then add to the sauce in the slow cooker and and then cook on high for 20 minutes to thicken. While the sauce is thickening shred the chicken with 2 forks. After the 20 minutes add the chicken back into the cooker, stir to combine. 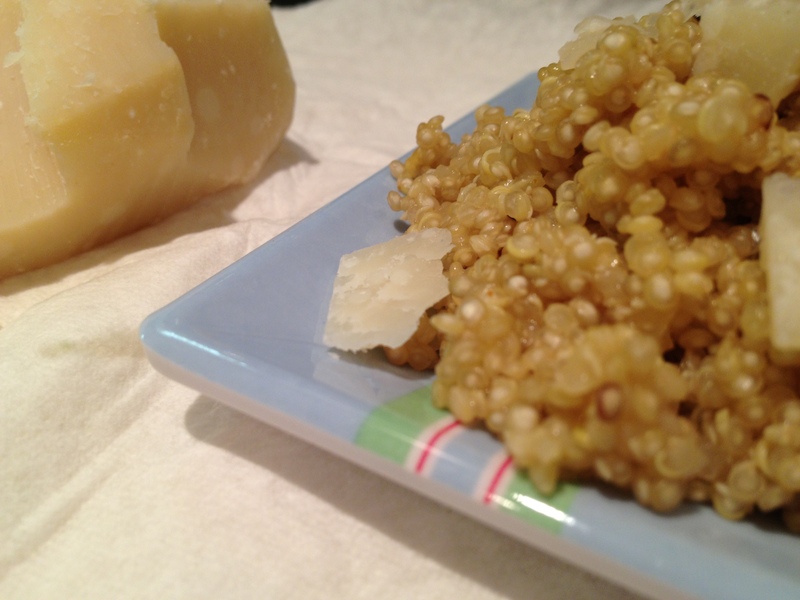 Serve over quinoa and garnish with the scallions.